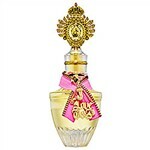 Introducing Juicy Couture's 'it girl' fragrance. Where she goes, the party follows. Her rule? Do the don'ts—show off, be loud, spoil yourself, talk to strangers—and love life! This scent opens with a top of succulent pink grape accord frolicking in a field of natural orange flower and mandarin. A heart of blushed plum and honeysuckle flirts with bold star jasmine. At back, creamy sandalwood lazes with moist amber in a haze of rich vanilla. Mix it with love and make the world smell good.